The last few weeks have seen two exciting announcements in the search for extraterrestrial water. On August 20 NASA announced the confirmation of water ice on the Moon, reinforcing our understanding that it is not merely a dry lump of volcanic rock, dust, and meteorite debris. And on July 25 came an announcement of the discovery of a possible sub-surface lake on Mars. The discoveries add to an already impressive list of water-bearing locales in our solar system, and have whetted the appetites of scientists on a quest to find life-friendly environments beyond the Earth. The confirmation of lunar ice came from analysis of data collected by NASA's Moon Mineralogy Mapper (M3) instrument aboard the Chandrayaan-1 spacecraft, which was launched by the Indian Space Research Organization in 2008. M3 was able to distinguish patches of water ice on the Moon by the way that it reflects visible light and absorbs infrared light. The ice exists at both of the Moon's poles, where there are places never exposed to direct sunlight. At the poles, the sun never gets more than a few degrees above the horizon, so the floors of some deep impact craters and other polar nooks and crannies are in permanent shade and the temperatures never rise above about -250 degrees Fahrenheit. 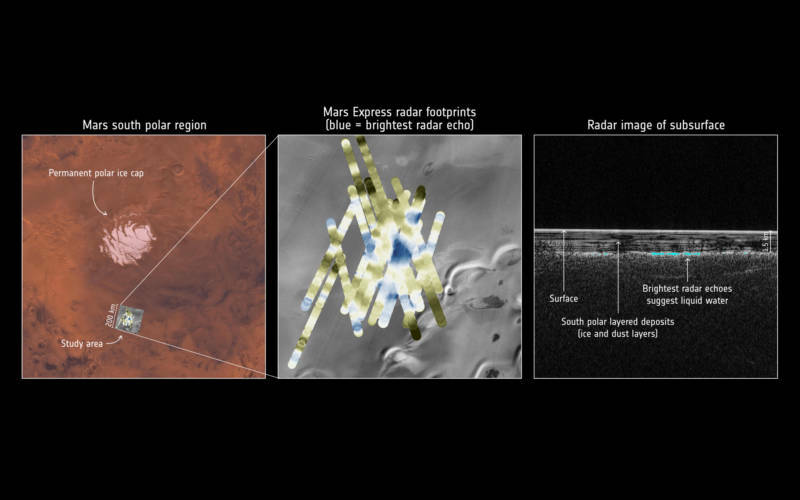 Data collected by a ground-penetrating radar instrument, MARSIS, aboard ESA's Mars Express spacecraft has convinced mission scientists that a body of liquid water, 12 miles across, exists a mile deep beneath a crater near Mars' southern pole. It took several years of data collection and over 29 south pole flyovers for the picture to develop, but the characteristics of the radar waves bouncing back to the spacecraft strongly indicate a patch of salty liquid: either a mass of brine-saturated mud, or an actual lake. Whichever the case, the discovery has scientists eager for a follow-up investigation. Not only would reservoirs of water offer a vital resource to future human missions on Mars, a liquid water environment protected from the frigid, radiation-exposed surface above could provide a suitable habitat for microbial Martian life. And mission scientists point out that there is no reason there could not be more subsurface lakes on Mars awaiting discovery, either by future missions or further analysis of data already collected. Confirming liquid water beneath Mars' surface may also help us to understand what happened to the vast seas of surface water believed to exist on Mars long ago. Water is not exceedingly rare in the Universe. Comets are full of water ice, and many moons in the outer solar system are well known for their surface ice or frozen water crusts. We've long known of Mars' polar ice caps. Water, in its frozen form, is commonplace out there. But mix water ice with a source of heat (sunlight or gravitational tidal energy, for examples) and adequate pressure and you get a liquid water cocktail that makes scientists' mouths water. Not only is liquid water essential for life as we know it, we also know that life on Earth can adapt to and thrive in extremely harsh conditions. 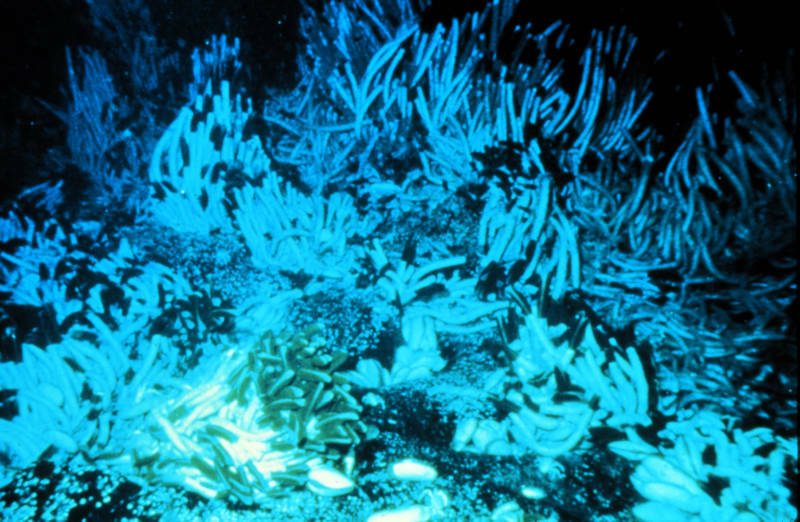 "Extremophiles" are terrestrial life forms, mostly microbial, that we find in environments of extreme heat, cold, and toxicity. Extremophiles have taught us that looking for extraterrestrial life in harsh conditions on other worlds is not a futile effort, especially where liquid water is present. Where Else Do We Find Liquid Water? 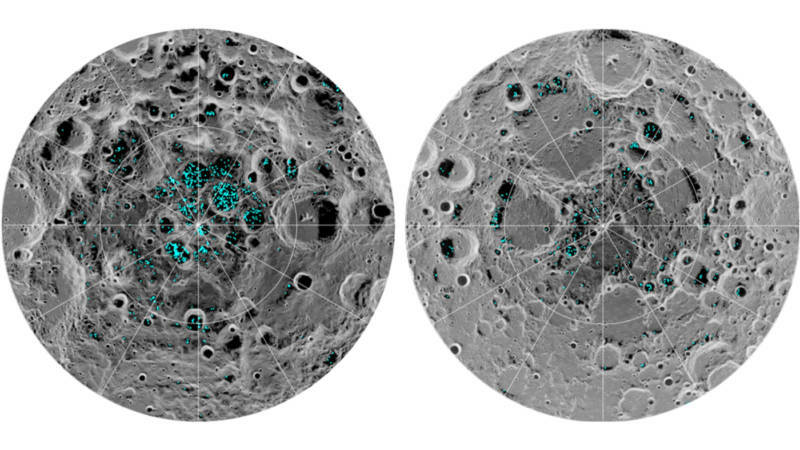 The two recent revelations of found water (even though the Moon's crater-shaded oases consist of ice) add to a tantalizing list of wet places found across our solar system. The outer solar system—the realm of Jupiter, Saturn, Uranus and Neptune—was once thought to be too cold for hopes of finding liquid water. But decades of robotic exploration have revealed that there is probably far more water out there than in the inner solar system, Earth included. In the 1970's and 1980's the Voyager and Galileo spacecraft detected what may be a vast ocean hidden beneath the icy crust of Jupiter's moon Europa. Patterns in the cracks of its frozen crust suggest the outer icy shell is floating on an ocean of liquid, much like sheets of sea ice surrounding parts of Antarctica. The ice-topped ocean is probably global in extent and, remarkably, may be a hundred miles deep. 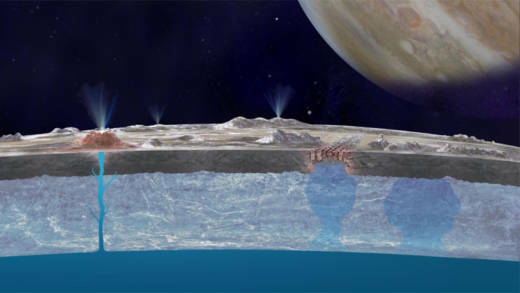 Europa alone may possess twice as much water as in all of Earth's oceans. There is also evidence that a subcrustal liquid water ocean exists in another of Jupiter's moons, the largest moon in the solar system, Ganymede. In fact, Ganymede's ocean may contain more water than Europa's. Since the Cassini spacecraft began exploring the Saturn system in 2004, scientists have observed clear signs of water within the moon Enceladus, and possibly the large moon Titan. In the case of Enceladus, Cassini detected plumes of water vapor and ammonia spewing out of large cracks in the moon's surface. Measurements by the Dawn spacecraft have turned up evidence of possible liquid water on the dwarf planet Ceres. White-looking mineral deposits — which appear to have been left behind by fluid eruptions in craters and cinder-cone-like structures — support speculation that at some time in the past, Ceres had a subcrustal ocean. It may still have one today. The sprinkling of so many watery places across our solar system gives us hope not only for finding life-friendly environments close to home, but across our galaxy as well. We now know of several thousand extrasolar planets orbiting hundreds of other stars. If oceans are as common as our solar system indicates (Earth, young Mars, Europa, Ganymede, Titan, Enceladus, and Ceres, to name the known or suspected wet spots), then extrasolar oceans probably are as well. And, if life is as eager to arise in those exo-oceans as it was on the primordial Earth, we may have a lot of company in the cosmos.